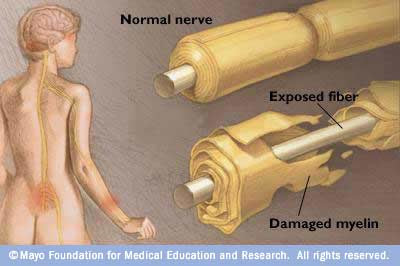 Guillain-Barre syndrome is an uncommon disorder in which your body's immune system attacks your nerves. Weakness and numbness in your extremities are usually the first symptoms. These sensations can quickly spread, eventually paralyzing your whole body. The exact cause of Guillain-Barre syndrome is unknown, but it is often preceded by an infectious illness such as a respiratory infection or the stomach flu. Luckily, Guillain-Barre syndrome is relatively rare, affecting only 1 or 2 people per 100,000. 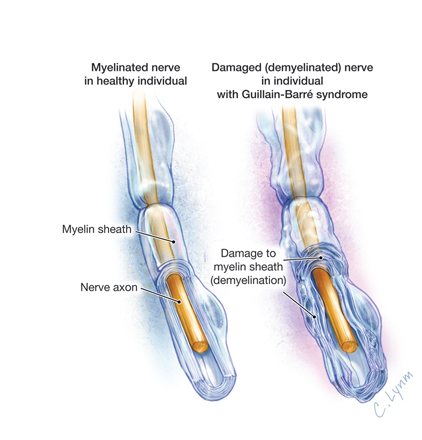 In its most severe form, Guillain-Barre syndrome is a medical emergency requiring hospitalization. There's no known cure for Guillain-Barre syndrome, but several treatments can ease symptoms and reduce the duration of the illness. And most people do recover completely. Guillain-Barre syndrome often begins with weakness, tingling or loss of sensation starting in your feet and legs and spreading to your upper body and arms. These symptoms may begin — often not causing much notice — in your fingers and toes. In some people, symptoms begin in the arms or even the face. As the disorder progresses, muscle weakness can evolve into paralysis. Most people with Guillain-Barre syndrome experience their most significant weakness within three weeks after symptoms begin. In some cases, signs and symptoms may progress very rapidly with complete paralysis of legs, arms and breathing muscles over the course of a few hours. The exact cause of Guillain-Barre syndrome is unknown. In about 60 percent of cases, an infection affecting either the lungs or the digestive tract precedes the disorder. But scientists don't know why such an infection can lead to Guillain-Barre syndrome for some people and not for others. Many cases appear to occur without any triggers. In Guillain-Barre syndrome, your immune system — which usually only attacks foreign material and invading organisms — begins attacking the nerves that carry signals between your body and your brain. Specifically, the nerves' protective covering (myelin sheath) is damaged and this interferes with the signaling process, causing weakness, numbness or paralysis. ■ Breathing difficulties. A potentially deadly complication of Guillain-Barre syndrome is that the weakness or paralysis can spread to the muscles that control your breathing. You may need temporary help from a machine to breathe when you're hospitalized for treatment. ■ Residual numbness or other sensations. Most people with Guillain-Barre syndrome recover completely or have only minor, residual weakness or abnormal sensations, such as numbness or tingling. However, full recovery may be slow, often taking a year or longer. Severe, early symptoms of Guillain-Barre syndrome significantly increase the risk of serious long-term complications. The first step in diagnosing Guillain-Barre syndrome is for your doctor to take a careful medical history to fully understand the cluster of signs and symptoms you're experiencing. A spinal tap (lumbar puncture) and nerve function tests are commonly used to help confirm a diagnosis of Guillain-Barre syndrome. This procedure involves withdrawing a small amount of fluid from your spinal canal at your low back (lumbar) level. This cerebrospinal fluid is then tested for a specific type of change that commonly occurs in people who have Guillain-Barre syndrome. ■ Electromyography reads electrical activity in your muscle to determine if your weakness is caused by muscle damage or nerve damage. ■ Nerve conduction studies assess how your nerves and muscles respond to small electrical stimuli. ■ Following the first symptoms, the condition tends to progressively worsen for about two weeks. ■ Symptoms reach a plateau and remain steady for two to four weeks. ■ Recovery begins, usually lasting six to 12 months. ■ Plasmapheresis. This treatment — also known as plasma exchange — is a type of "blood cleansing" in which damaging antibodies are removed from your blood. Plasmapheresis consists of removing the liquid portion of your blood (plasma) and separating it from the actual blood cells. The blood cells are then put back into your body, which manufactures more plasma to make up for what was removed. It's not clear why this treatment works, but scientists believe that plasmapheresis rids plasma of certain antibodies that contribute to the immune system attack on the peripheral nerves. ■ Intravenous immunoglobulin. Immunoglobulin contains healthy antibodies from blood donors. High doses of immunoglobulin can block the damaging antibodies that may contribute to Guillain-Barre syndrome. Each of these treatments is equally effective. Mixing the treatments or administering one after the other is no more effective than using either method alone. Often before recovery begins, caregivers may need to manually move your arms and legs to help keep your muscles flexible and strong. After recovery has begun, you'll likely need physical therapy to help regain strength and proper movement so that you'll be able to function on your own. You may need training with adaptive devices, such as a wheelchair or braces, to give you mobility and self-care skills. The emotional impact of Guillain-Barre syndrome can be devastating. In severe cases, Guillain-Barre syndrome can transform you from healthy and independent to critically ill and physically helpless — suddenly, and without warning. Although most people eventually recover fully, a diagnosis of Guillain-Barre syndrome means confronting the possibility of long-term disability or paralysis. And those who do develop these complications must adjust to lasting, limited mobility and a dependence on others to help manage daily activities. Talking with a mental health provider can play a critically important role in helping you cope with the mental and emotional strain of this illness. In some cases, your therapist may recommend family counseling to help you and your loved ones adjust to the changes caused by Guillain-Barre syndrome. You may also benefit from talking with others who have experienced this illness. Ask your doctor or mental health provider to recommend a support group for people and families coping with Guillain-Barre syndrome.